Begin this walking tour at Downtown LA’s Union Station. From the Convention Center, walk to the Venice/Figueroa intersection and hop on Bus 733 toward Downtown LA-Union Station. Get off the bus at Cesar Chavez Ave. & Alameda Street (Stop ID:656) where you will land just three minutes away from Union Station and the beginning of the walking tour. Union Station was the last of the great rail stations (opened 1939) and carefully restored to its full glamour, Union Station is a romantic blend of Spanish Mission, Moorish and Streamline Modern elements. Imagine glamorous movie stars rushing across the elaborate marbled floor to catch a train east. Walk down Alameda Street to Temple Avenue, west to Main Street to LA City Hall. The landmark has been recently restored (post-earthquake necessity). Built in 1928 in a quirky mix of styles, the top of the building pays homage to an ancient mausoleum. Add to that a little American skyscraper, Egyptian, Greek, Roman, Romanesque and Byzantine design. The rotunda dome is elaborately tiled and is a "must-see" for any trip to LA. For years, no other Downtown LA building was permitted to be taller (32 floors). The 27th floor Observation deck is open Monday to Friday 10 a.m. to 4 p.m.
Exit on the Spring Street side and walk south to 5th Street, then five blocks west to the LA Central Public Library. Watch your timing so you can take a docent-led tour (Monday to Friday 12:30 p.m., Saturday 11 a.m. and 2 p.m., and Sunday at 2 p.m.). If you miss the tour, roam around on your own. The library — opened in 1926 — is a mix of Egyptian (the post-Tut influence), Byzantine and Spanish designs. The second-floor rotunda of the old wing has a spectacular chandelier, ceiling and massive murals — an LA tradition. After that, go see the postmodern, eight-story atrium in the new Tom Bradley Wing. Library hours are Monday to Thursday 10 a.m. to 8 p.m., Friday and Saturday 10 a.m. to 6 p.m. and Sunday 1 p.m. to 5 p.m.
There’s a lunch possibility next door at Café Pinot. The patio has great views of the surrounding park and tall buildings. As you leave the Library on the 5th Street side, look up — way up. Across the street is the U.S. Bank Tower, the tallest structure west of the Mississippi (more than 1,000 feet tall — no roof access). Next to it are the Bunker Hill Steps, 103 graceful steps patterned on Rome’s Spanish Steps. Just east of the Library is the Millennium Biltmore Hotel, one of the places in LA to stay for presidents, kings and movie stars since 1923. The lush Italian/Renaissance style lobby is filled with columns, frescoes and boasts a dazzling ceiling. For a late lunch, head to Grand Central Market by continuing east on 5th Street to Broadway, then north. Opened in 1917, this is one of those bustling, tempting marketplaces reminiscent of Europe. Plenty of choices are here when it comes to a fast meal or snack: Mexican, kebabs, Chinese, Salvadoran, Mongolian and more. The stalls sell fresh and sometimes, unusual fish and meats, plus produce. At the southwest corner of Broadway and 3rd Street is the Bradbury Building, a 1893 reddish brick, Renaissance-style structure. “Office building” doesn’t begin to do it justice. 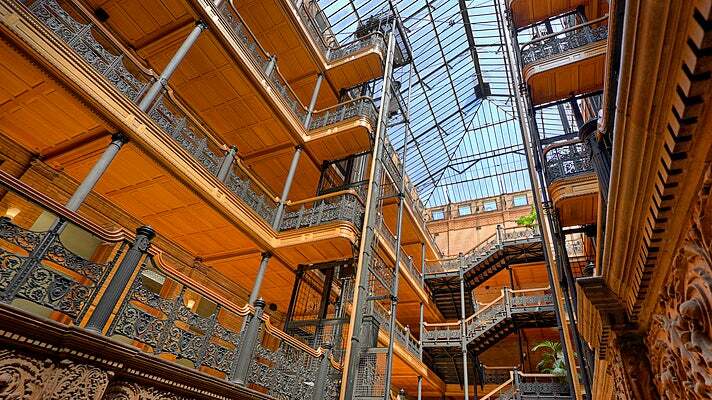 The one-of-a-kind interior features a five-story atrium finished with glazed bricks, wrought-iron grillwork (including the cage elevator that will be familiar from the many movies filmed here). The building is open to visitors Monday to Friday 9 a.m. to 5 p.m. and you too can ride that famous elevator. Brochures are available in the lobby. Stroll south down Broadway for several blocks, probably the busiest street in LA, to see the elaborate façades — some faded, some sparkling — of long-ago movie palaces. This district has the greatest concentration of pre-WWII movie palaces and office buildings in the U.S.